IBC Bank CEO and Chairman of the Board Dennis Nixon, presents a hefty check to Virginia Garrard and Greg Fences of the University of Texas at Austin. The donation will help create a $1 million endowment supporting the education of "Latin American studies" students. October 26, 2017. Austin, Texas - LLILAS Benson Latin American Studies and Collections at The University of Texas at Austin is pleased to announce the receipt of a contribution in the amount of $500,000 from the IBC Foundation. The contribution will be matched by funds from a gift given by UT alumnus Bobby Patton Jr. and his wife, Sherri Patton, to the College of Liberal Arts. The end result will be the establishment of a $1 million endowment supporting the education of Latin American Studies students. The IBC Foundation's contribution was acknowledged at a student awards dinner hosted by the LLILAS Benson Advisory Council on October 25, which was attended by chairman of the board and CEO of IBC Bank Dennis E. Nixon and UT Austin president Gregory L. Fenves, as well as Latin American Studies students who receive educational funding provided by generous endowments, and LLILAS Benson faculty and staff. The Teresa Lozano Long Institute of Latin American Studies (LLILAS) is the top Latin American Studies program in the United States, with a roster of some 170 affiliated faculty in 30 departments across the university. Through its interdisciplinary offerings and degree programs from BA to PhD, LLILAS provides training and expertise that prepares students for a wide variety of careers. Student funding includes academic and travel awards. The IBC Foundation's contribution will significantly enhance educational opportunities for students interested in Latin America. 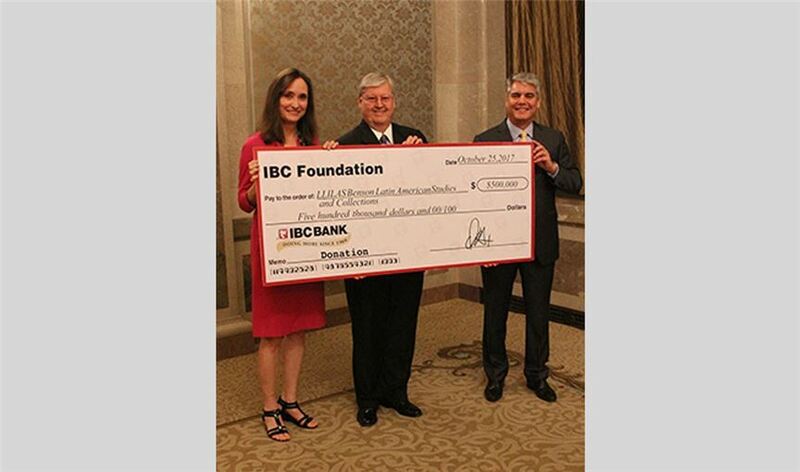 "Our donation to LLILAS is a natural fit for the IBC Foundation," said Dennis E. Nixon, Chair and CEOof IBC Bank. "This contribution will help provide students with the tools needed to excel in their educational endeavors. Service to our communities and ensuring their success is at the heart of who IBC is an organization, it's a tradition we started since being founded in 1966 and we continue to carry out today." "The IBC Foundation and the Patton family have made an inspiring and generous commitment to our university," said UT president Gregory L. Fenves. "Current and future UT Latin American Studies students will benefit greatly from this new endowment, which will improve access to a program that is one of the best in the world." Virginia Garrard, director of LLILAS Benson, emphasizes the positive impact of the IBC Foundation contribution on student programs. "This generous contribution by the IBC Foundation is a powerful acknowledgment of the importance of area studies in Latin America, and one of the largest gifts that LLILAS Benson has ever received," said Professor Garrard. "It will allow us to continue to recruit the brightest and most promising students in the field." Joe R. and Teresa Lozano Long, outgoing Advisory Council co-chairs, were instrumental in reaching out to Mr. Nixon and the IBC Foundation. The Longs remarked on the impact of the contribution and the matching funds: "The $500,000 contribution from the IBC Foundation, which in turn was matched by $500,000 from the College of Liberal Arts, gives LLILAS a $1,000,000 endowment for its students. These are the types of contributions that make a significant difference in the school and its ability to deliver its programs to various students. We are very grateful to IBC Foundation and the College of Liberal Arts for both of these outstanding contributions, and we look forward to receiving additional funds in support of the school." Myra Leo, chair of the LLILAS Benson Advisory Council, echoed the Longs' appreciation on behalf of LLILAS Benson and the Council: "We are most grateful for the invaluable efforts made by Joe and Terry Long and the LLILAS Benson staff in strategically crafting a proposal deemed worthy of embracing by Mr. Nixon and his team. The Advisory Council applauds all of these efforts and is very grateful as well to the Patton Family and UT President Greg Fenves for his thoughtful and consistent support of LLILAS Benson." The $1 million endowment, made possible by the IBC Foundation's contribution to LLILAS Benson, will significantly increase the amount of funding available to students, allowing more promising scholars to be educated by the country's foremost center of Latin American Studies.